Belize – Offshore corporations, offshore banking and residency possibilites with no taxes. Belize (formerly British Honduras) is the only English-speaking nation in Central America, its offshore laws ensure maximum financial privacy. These laws allow asset-protection trusts, maritime registration and encourage international business and banking. 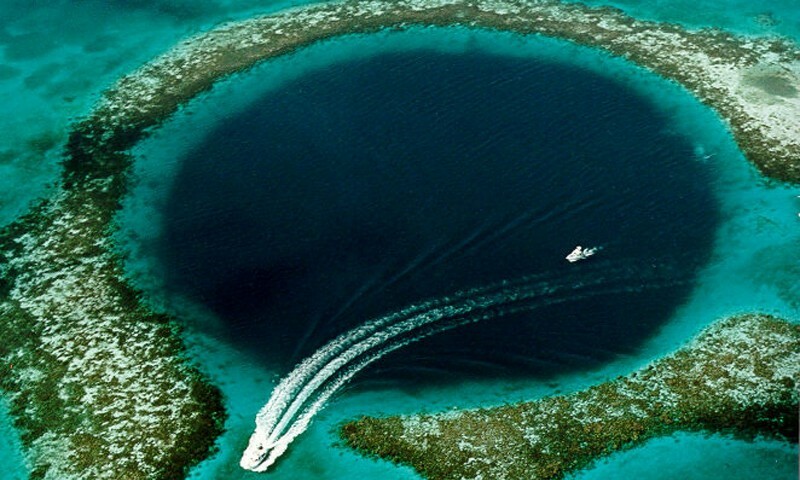 The Great Blue Hole in Belize. Picture courtesy of guyspeed.com. Click on the image for larger picture. There are no local income taxes, either personal or corporate, and no currency exchange controls. So it’s a place where you can arrange your affairs so you gain residency here but pay no taxes locally. And one of the most attractive benefits is that you can maintain your residency in Belize without actually spending much time there. In Belize people are friendly, oceanfront real estate is still relatively cheap, and Belize’s parliament, courts and government are low tax and pro-offshore. Designed to attract foreigners as residents, Belize’s “qualified retired persons” (QRP) program resembles Panama’s popular pensionado program. The QRP (administered by the Belize Tourism Board) offers significant tax incentives to those who become permanent residents of Belize, but not full citizens. The program is mostly aimed at residents of the U.S., Canada and the U.K., but it’s open to all. When you qualify, you’re exempted from all taxes on income from sources outside Belize. QRPs pay no import duties on personal effects, household goods or on a motor vehicle or other transport, such as an airplane or boat. There’s no minimum time you have to spend in Belize and you can maintain your status so long as you maintain a permanent local residence, such as a small apartment or condo. You must be 45 years of age or older to qualify and be able to prove personal financial ability to support yourself and any dependents. Initial fees for the program are $700, plus $100 for an ID card upon application approval. The minimum financial requirements include an annual income of at least $24,000 from a pension, annuity or other sources outside Belize.